Mulberry Tree (Morus spp. ): growing, planting, caring. Often used on terraces in the south for the shade it provides, the mulberry tree can however adapt in many regions. Scientific name : Morus spp. 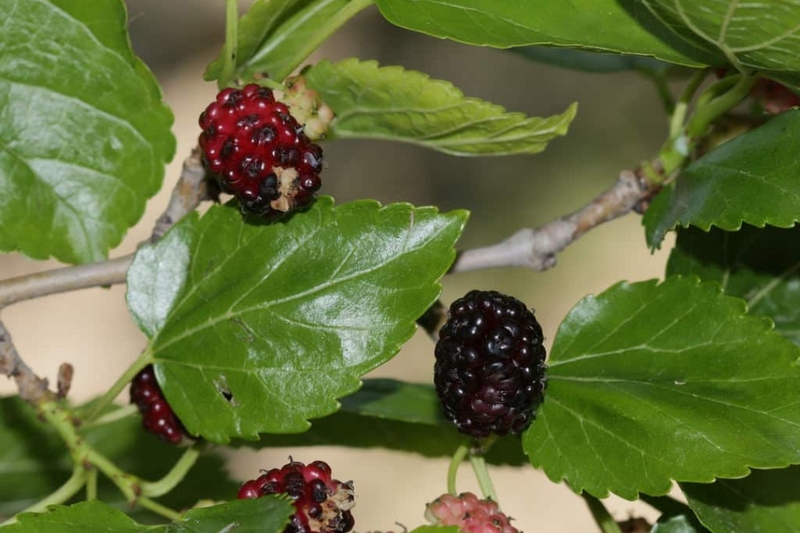 Morus, a genus of flowering plants in the family Moraceae, comprises 16 species of deciduous trees commonly known as mulberries, growing wild or under cultivation in many temperate regions. The closely related genus Broussonetia is also commonly known as mulberry, notably the paper mulberry - Broussonetia papyrifera. Mulberries are fast-growing when young, but soon become slow-growing and rarely exceed 10–15 metres (30–50 ft) tall. The leaves are alternately arranged, simple and often lobed and serrated on the margin. Lobes are more common on juvenile shoots than on mature trees. The mulberry fruit is a multiple fruit, approximately 2–3 cm (3⁄4–1 1⁄4 in) long. Immature fruits are white, green, or pale yellow. In most species the fruits turn pink and then red while ripening, then dark purple or black, and have a sweet flavour when fully ripe. Plant in drained, neutral or acidic soil, in full sun, in areas where the annual sunshine is long. Plant preferably in winter, in bare roots or in mound. Dig a hole deep enough, twice as large as the root ball, without mixing the layers of the soil. Plant a solid stake at the bottom of the hole, on the edge, inclined to the prevailing winds. Cut the root hair - the fine roots that looks like hair - to balance the volume of roots and foliage. Plant without burying the boundary between trunk and roots of the tree, putting the soil layers in the same order you removed them. Tamp the soil around the roots with your foot, so you do not leave a pocket of air, and attach the stake to the trunk with a suitable extensible link. Form a hollow in the soil and water abundantly until you fill it. Water regularly and generously for several weeks after planting, especially if you did it late in the season. In a pot, water once . a week. After two to three years, the stake has no use anymore and might harm your tree : remove it. Every year, consider harvesting fruits between June and August. Prune slightly each year if you want fruits, and conversely if they annoy you, cut a lot. The operation should be done from January to March. Cut the low branches, damaged branches and those that cross.